Have you noticed how challenging it is to become the person you want to be, the best version of yourself? 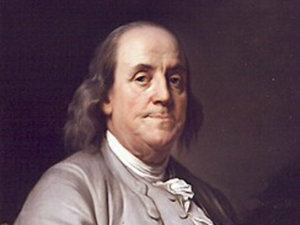 Benjamin Franklin desired to become the best version of himself; he shared in his own journal that he wanted to be a man of high moral character, a virtuous man. And as a means to accomplish that, he identified the 13 virtues (eight personal and five social) that he wanted to demonstrate in his daily life. He decided that he would focus on one of those virtues for a solid month before moving on to the next one. At the end of the 13 months, he returned to the first one and repeated the process. He did this from his early 20’s until his death at 84. And to further assist himself with this self-improvement plan, he carried around a small journal in which he would daily evaluate his performance on that particular virtue. Humility: Imitate Jesus and Socrates in humility – focusing on others, not oneself. Franklin used a chart to track his progress. 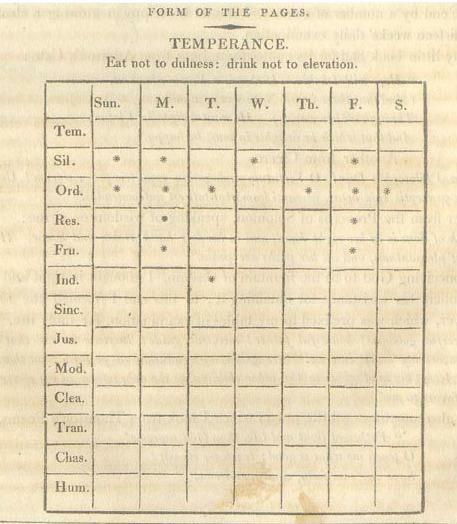 This is the chart for Temperance. Each virtue has its own similar chart. While Franklin strove to live these virtues, history reflects that he did not always succeed. Nonetheless, we can safely say that by identifying and focusing on 13 virtues, he no doubt improved his overall character considerably more than if he had not carried out this kind of self-development plan. What virtues or values do you want to demonstrate in your daily life? Give that careful thought and then commit them to writing and begin each day with a time of prayer and/or reflection on these, their importance, and how you intend to live them out that day. And consider as well Franklin’s strategy of focusing on just one virtue/value for an entire month and on assessing each day in writing how well you did that day in living out that virtue. Finally, consider inviting a friend or family member to be your accountability partner and set up a regular time with them to discuss how you’re doing. Becoming the best version of yourself is so important in living a great life – and after all, it’s your life and what you did each day that will be your lasting legacy.